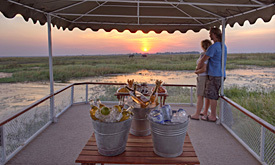 Featuring just six superlative ensuite safari tents, carefully positioned in exclusive semi-permanent camps (on or near the Chobe River), is the elegant Chobe Under Canvas, situated in the Northern part of the Chobe National Park. Nxabega Okavango Tented Camp is set in a private concession of 8 000 hectares (19 800 acres) to the southeast of the Moremi Wildlife Reserve in the centre of one of the most unique regions in the world, the Okavango Delta. 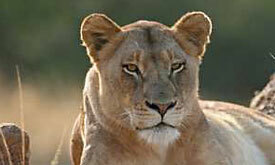 Renowned for its lush waterways and abundant wildlife, the Okavango is home to a number of aquatic and land species. 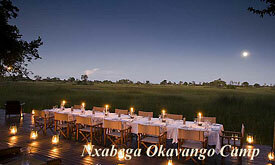 From under a canopy of African ebony trees, Nxabega Okavango Tented Camp faces out over expansive lagoons and channels. With expansive Okavango views, nine exclusive tented suites are strung out on either side of the handsome thatched guest areas of the camp. Burnished teak floors and a lofty roof frame the sitting and dining areas. 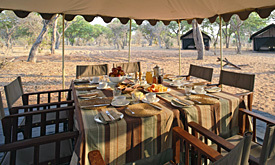 Private bush dinners, breakfasts in bed, lamplit cocktails on a river island or a walking safari with al fresco picnic are provided with pleasure by Nxabega’s warm and friendly staff. 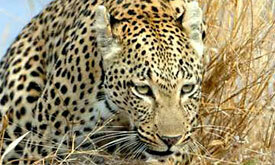 Nxabega Okavango Tented Camp combines more than just two worlds – the remote and wild game viewing experience of Botswana’s lush grasslands offsets the intricate detail of the hidden world of the Delta’s waterways, while the simplicity of canvas merges with the elegance of an exclusive club.